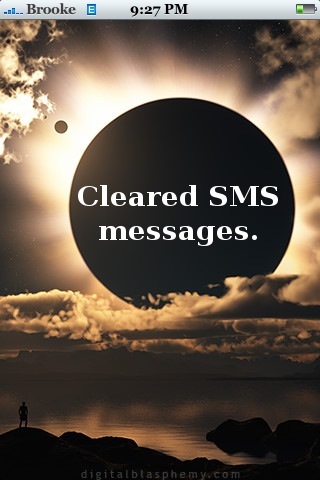 Clear SMS is a simple application that allows you to delete all your Texts with one tap. 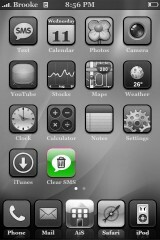 When you install Clear SMS, it will add an icon to your SpringBoard. When you tap on the icon you will get a splashscreen while it deletes all your texts. As convenient as a one-touch solution is…I think it might be nice to have a pop-up on this type of application where you can select yes/no just in case you bump the application…you don’t want it to accidentally delete all your texts!! So, it might even be an application you hide or put in a category so that it is not right on your SpringBoard where people could select it without knowing what it is or you could accidentally bump it. 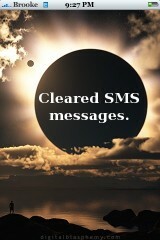 Clear SMS is avialable through the Planet-iPhones source. Hi nice app but when i use it after deleting it goes into lock screen.Is this normally? Hi, Im a newbie to all things tech and have been looking for this app (clear SMS) for a long time. Im a bit lost on how to download. If someone can indulge this green rookie with some simple english instructions I would be eternally gratefull.